Oppo sold out 200,000 units of the Realme 2 during its first flash sale last week. Another was scheduled for today and it was an immense success as well, rounding up the total number of sold devices to 370,000. The sub-brand celebrated the achievement on Twitter and thanked its Indian fans who purchased the affordable smartphone in numbers. The Oppo Realme 2 is exclusive to India but is receiving a warm welcome from consumers and smartphone lovers from all over the world. Priced extremely aggressively, it still comes with a very decent specs sheet, complete with dual cameras, stand-out design, and big battery. The 3/32 GB variant of the smartphone with a Snapdragon 450 chipset costs INR8,990 (about $130/€110), while the 6/64 GB version is INR11,990 ($155/€130). 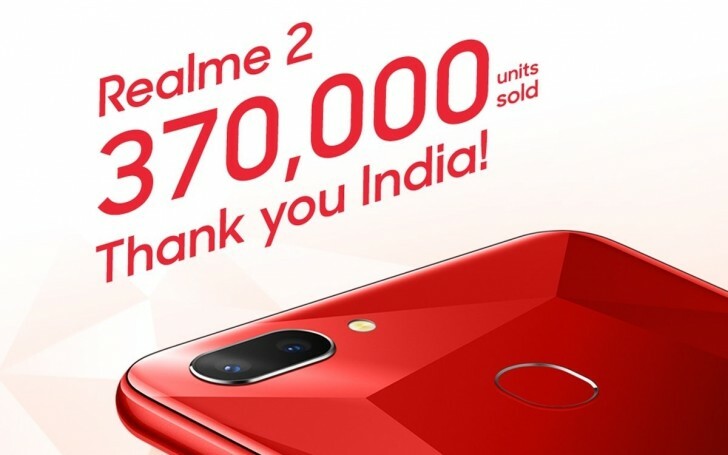 The Realme 2 is currently offered in either Diamond Black or Diamond Red; a third option called Diamond Blue is set to appear next month. Yeah and my phone has fast charging. Mines a much better deal. And no, it's not mid range. J series is low end.